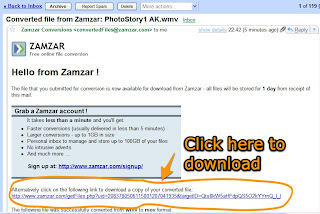 Firstly make your Photostory 3 slideshow. Don't make it too long or it will take forever to upload. 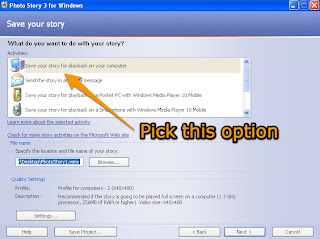 Save it as a Photostory in case you want to edit it later but also save it for playback on your computer to compress it. Mine looked like a black box when it was done. This is how the movie looked when I went to play it. Close it when you have admired your handiwork. 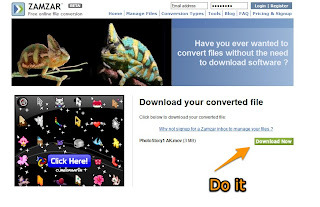 Now log on to the internet and go to Zamzar to convert it to a .mov file. 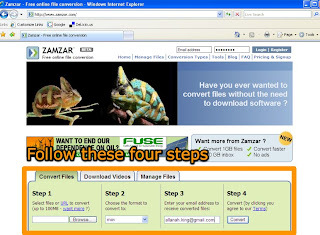 Do these four steps. Go and have a cup of coffee or something useful! 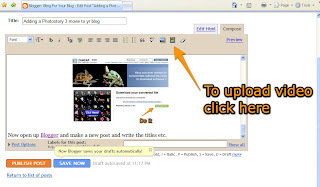 Now open up Blogger and make a new post and write the titles etc. 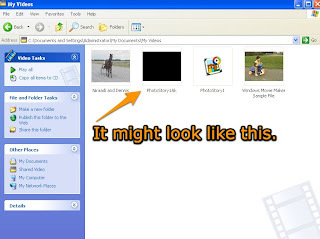 Click on the little movie next to the add a photo button. 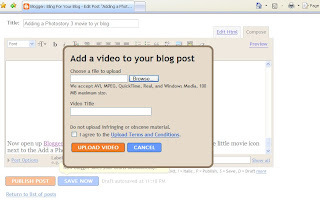 The screen will go cloudy for a bit then you will get to browse to the movie you want to upload- add a title and promise not to upload copyrighted movies and Blogger will upload it in its own sweet time. While Blogger is uploading and processing your movie go and do something physical to prove that you don't just in front of the computer all day and night. Eventually Blogger will process the movie and you will be ale to see the first frame in your post. Publish it and you are done. You clever thing you! I love how much exercise and movement it actually takes to load a movie into Blogger. I guess I'll have to start doing that just to get my body moving every once in while. 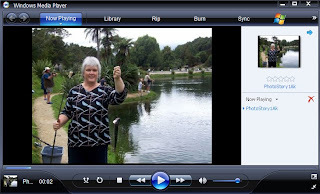 Make and narrate slideshow in iPhoto. 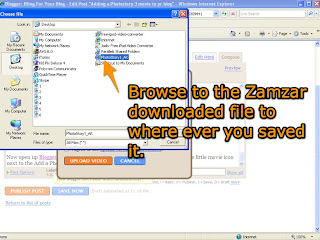 Export as a quicktime file. Life would be easier if we all had Macs!!! VERY useful information. Nice use of screen captures. Thanks. Allanah, you are a tech angel!! Thanks Allanah - you are so generous with your resources! I will certainly be referring back to this site for help as I improve my class blog. Thank you for this great resource. I will try to insert something like this in my blog.